All transactions are safe and secure with a reliable history in online purchasing behind each of our associates. 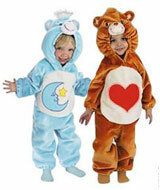 Buy the Kids Care Bears Costumes to own Care Bears clothing and merchandise. Few things are cuter than child and adult Care Bears costumes, but that isn't the only perk; they are also soft and warm. There are a variety of options, including blue Bedtime (moon), brown Tenderheart (heart), yellow Funshine (sun), blue Grumpy (rain cloud), blue Champ (trophy), orange Friend (two smiling flowers), and the pink Cheer Bear costume (rainbow). Not sure who is your favorite? They all have their own personality, so check out a Care Bears DVD to watch them in action. In addition to the Kids Care Bears Costumes above, browse the Care Bears Clothing Gallery for more apparel like men's and women's clothes, kids shirts or hoodies.